Posted on 7th January 2014 by Gavin in Media. comment(s). 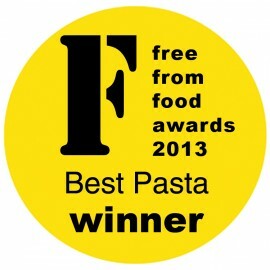 Our award winning pasta perfectly retains its shape and texture when cooked, something on which we’re constantly complimented, and tastes great, too! Available in seven shapes, including children’s Fantasia, making this the ideal choice for any pasta dish. Naturally wheat and gluten free, this complex carbohydrate is the perfect source of fibre to include in everyone’s diet.